NTSB: Accident Report on Harry Bell Plane Crash, 7-5-2012 (Final). The flight instructor and commercial pilot were conducting a flight review during daytime visual flight rules conditions. Multiple witnesses near the accident site reported observing the accident airplane descending in a nose-low attitude while spinning. Witness reports, findings from the wreckage examination and recovered GPS data are consistent with the airplane entering a stall as part of the flight review and a subsequent spin. A postaccident examination of the airframe and engine revealed no evidence of mechanical malfunctions or failures that would have precluded normal operation. The airplane was equipped with dual flight controls; however, it could not be determined which pilot was manipulating the controls at the time of the accident nor could it be determined why neither pilot was able to recover from the spin. The airplane was also equipped with a rescue ballistic parachute system. The arming handle was found fractured from the cabin roof due to a force on the handle that loaded the adhesive joint in peel mode. The arming pin was not engaged within the arming handle and exhibited a permanent bend. Fretting wear deposits were present on the retaining pin shank, suggesting that the pin was most likely engaged within the handle a significant portion of the time when the airplane was in motion. It could not be determined if the arming pin was removed before the flight or at some point during the flight. The parachute was not deployed. Medical record review revealed that the left seat pilot had significant preexisting heart disease. However, due to the limitations of the available medical evidence, the investigation could not determine if the pilot had an acute cardiac event during the flight that degraded his ability to operate the aircraft. Toxicology tests for the pilot were positive for Metoprolol, Ticlopidine, and Valsartan, which are commonly used to treat high blood pressure and angina, to control heart rate in some arrhythmias, and to reduce the risk of stroke. Toxicology testing for the flight instructor, who was seated in the right seat, revealed evidence of previous marijuana use; however no active compound was detected in the postmortem blood, thus it is unlikely that he was experiencing acute impairment from marijuana at the time of the accident. The pilot's failure to recover from a stall, which resulted in a spin. Contributing to the accident was the instructor's inadequate remedial action. On July 5, 2012, about 1324 Pacific daylight time, a TL Ultralight SRO Stingsport, N177N, was substantially damaged when it impacted terrain near Piru, California. The airplane was registered to and operated by the pilot under the provisions of Title 14 Code of Federal Regulations Part 91. The certified flight instructor and commercial pilot receiving instruction were fatally injured. Visual meteorological conditions prevailed and no flight plan was filed for the instructional flight. The local flight originated from Whiteman Airpark (WHP), Van Nuys, California, at 1300. Multiple witnesses driving on Highway 126 within the vicinity of the accident site reported observing the accident airplane descending in a nose low attitude while spinning in a counter-clockwise direction before it descended below a tree line. Friends of the pilot and flight instructor reported that the purpose of the flight was to conduct a flight review for the pilot. It was not determined which one of the two pilots, a commercial pilot and owner of the airplane seated in the left seat or the certified flight instructor seated in the right seat, was manipulating the flight controls when the accident occurred. The pilot, age 89, held a commercial pilot certificate with an airplane single-engine land, single-engine sea, and instrument airplane ratings. The most recent third class medical certificate was issued to the pilot November 3, 2005. The pilot reported on his most recent medical application that he accumulated a total of 3,600 hours of flight time. Review of the pilot's logbook revealed that as of the most recent entry dated May 22, 2012, he had accumulated 3,999.3 total hours of flight time. The flight instructor, age 59, held an airline transport pilot certificate with an airplane single-engine land, airplane multi-engine land, and instrument airplane ratings. The pilot also held a flight instructor certificate with airplane single-engine land, airplane multi-engine land, and instrument airplane ratings. The most recent second class medical certificate issued to the pilot was on June 28, 2011, with no limitations stated. The flight instructor reported on his most recent medical certificate application that he had accumulated a total of 13,000 hours of flight time and 200 hours within the previous six months. The flight instructor's logbooks were not located. 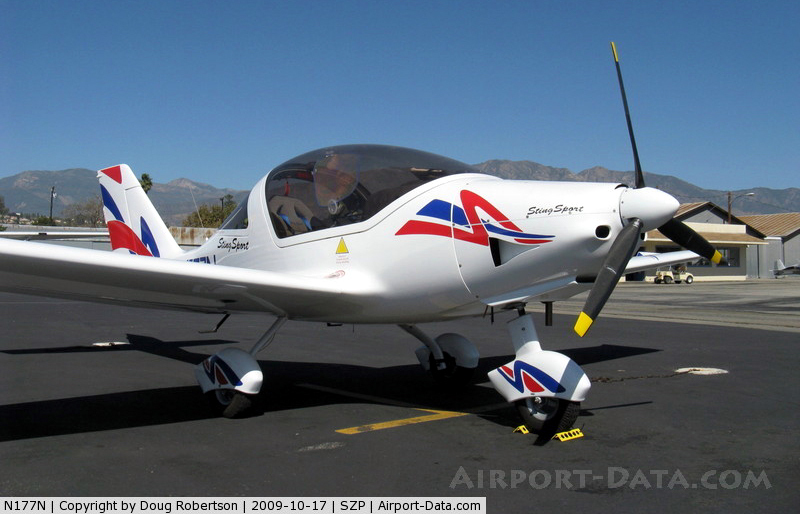 The light sport two-seat, low-wing, fixed-gear airplane, serial number (S/N) TLUSA 153, was manufactured in 2007. It was powered by a Rotax 912ULS engine, serial number 5647034, rated at 100 horsepower, driving a Wood comp ground adjustable three bladed wooden propeller. The airplane was equipped with a Galaxy Rescue Parachute System (GRS). Review of the airframe, engine, and propeller logbooks revealed that the most recent annual inspection was completed on July 1, 2012, at a Hobbs time of 214.1 hours and tachometer time of 215.9 hours. The airplane had accumulated about 1 hour of flight time since the annual inspection at the time of the accident. Review of the Pilot Operating Handbook (POH), Section 4, Normal Procedures, page 12, Pre Taxi checklist states under item 8, "GRS Safety Pin -- REMOVED and STOWED." Within the note section of page 13, the POH states in part "…Carefully remove the safety pin from the GRS activation handle. Stow it in a place where it can be easily reached after landing for securing it back into place. The canopy locking lever on the pilot's side is a recommended storing location. Then you will be reminded to secure the chute when you reach for the canopy latch to exit the cockpit." A review of recorded data from the Camarillo Airport (CMA) automated weather observation station, located about 20 miles southwest of the accident site, revealed at 1255 conditions were wind variable at 4 knots, visibility 10 statute miles, overcast cloud layer at 1,600 feet, temperature 18 degrees Celsius, dew point 15 degrees Celsius, and an altimeter setting of 29.98 inches of mercury. At 1355, CMA reported a broken cloud layer at 1,800 feet. Examination of the accident site revealed that the airplane came to rest upright within an open field adjacent to an orange tree orchard on an approximate heading of about 294 degrees magnetic. Wreckage debris remained within about 20 feet of the main wreckage. A large indention within the ground was located about 1 foot in front of the engine and contained two propeller blades. The fuselage was mostly intact and exhibited impact damage to the forward and lower areas of the fuselage. The Galaxy Rescue Parachute System's handle was found displaced from its respective mount location on the cabin roof structure. The securing pin was found removed and located within the main wreckage. The handle appeared to have remained within its housing and not actuated. The left wing remained attached to the fuselage. The left aileron and flap remained attached via all their respective mounts. The left flap appeared to be in a partially extended position. The right wing remained attached to the fuselage. The right aileron and flap remained attached via all their respective mounts. The right flap appeared to be in a partially extended position. The empennage was partially separated and displaced 45 degrees to the right, about one foot forward of the horizontal stabilizer. The vertical stabilizer and horizontal stabilizer remained attached to the empennage structure. The rudder was partially separated and remained attached via its lower mount. The elevator remained attached to its mounts, and the trim tab remained attached to the elevator. Flight control continuity was established from the left and right cockpit controls to all primary flight control surfaces. The engine remained attached to the engine mount structure. The 1/3 cylinder and 2/4 cylinder side carburetors remained attached. Both carburetors were disassembled and found unremarkable. The top spark plugs were removed and exhibited signatures consistent with normal operation. Rotational continuity was established throughout the engine and valve train when the propeller was rotated by hand. Thumb compression was obtained on all four cylinders. The propeller assembly remained attached to the engine crankshaft propeller flange. One propeller blade remained attached to the propeller hub and the remaining two blades were separated just outboard of the hub. The separated blades exhibited slight chord wise scratching. No evidence of any preexisting mechanical malfunction was observed during the examination of the engine and airframe. The cabin roof structure surrounding the parachute handle mount area, parachute arming handle, and arming pin were sent to the National Transportation Safety Board (NTSB) Materials Laboratory for further examination. According to the FAA medical case review; the 89-year-old pilot had a history of high blood pressure and coronary artery disease treated with bypass surgery and medications. He had not renewed his medical certificate since it expired November 30, 2006. 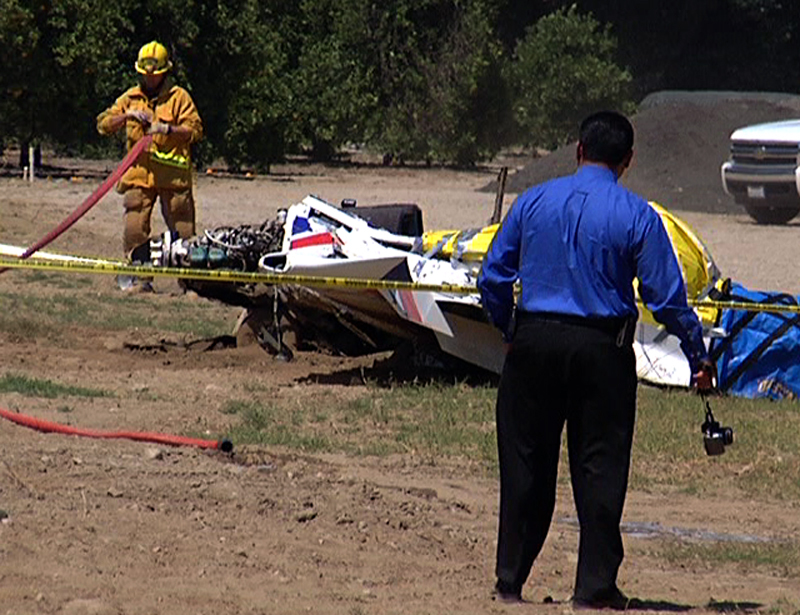 The Ventura County Medical Examiner conducted an autopsy on the pilot on July 7, 2012. The medical examiner determined that the cause of death was "...blunt force injuries." The autopsy noted a palpable subcutaneous pacemaker. The pacemaker was not interrogated. The cardiovascular system examination was limited by the degree of injury; the heart was not intact. The coronary arteries were not examined. The brain was not examined. The FAA's Civil Aeromedical Institute (CAMI) in Oklahoma City, Oklahoma, performed toxicology tests on the pilot. According to CAMI's report, no carbon monoxide was detected in the blood and no ethanol was detected in the vitreous. Metoprolol and Valsartan were detected in the blood and urine. Ticlopidine was detected in the urine but not the blood. Metoprolol is a beta blocker used to treat patients with cardiovascular disease. Valsartan is an angiotensin receptor blocker used to treat high blood pressure. Ticlopidine is used to prevent platelet aggregation (clotting) in patients at risk for strokes and also in people with coronary artery stents. According to the FAA medical case review; the 59-year-old flight instructor had a second class medical certificate with no restrictions or limitations. The Ventura County Medical Examiner conducted an autopsy on the flight instructor on July 7, 2012. The medical examiner determined that the cause of death was "...blunt force injuries." The FAA's Civil Aeromedical Institute (CAMI) in Oklahoma City, Oklahoma, performed toxicology tests on the flight instructor. According to CAMI's report, no carbon monoxide was detected in the blood and no ethanol was detected in the vitreous. Tetrahydrocannabinol was detected in the lung (0.0244 ug/ml) but not in the blood. Tetrahydrocannabinol is the psychoactive compound found in marijuana. Tetrahydrocannabinol carboxylic acid was detected in the blood (0.0071 ug/ml), in the urine (0.071 ug/ml) and in the lung (0.006 ug/ml). Tetrahydrocannabinol carboxylic acid is the inactive metabolite of tetrahydrocannabinol. Additionally, terazosin was detected in the blood and urine. Terazosin is an alpha blocker used to treat benign prostate disease. Two handheld global positioning system (GPS), Garmin GPSMAP 396 units were recovered from the airplane. The units were sent to the NTSB Office of Research and Engineering Recorders Laboratory for data extraction. The data revealed a flight track from the day of the accident showed the flight's departure from runway 12 at WHP, where the flight performed two take off and landings within the airport traffic pattern before proceeding on a northwesterly course. The data depicted that as the accident airplane continued on a northwesterly course, a 360-degree right turn and 360-degree left turn were performed followed by a 90-degree turn to the right and left. About 3 miles south of the accident site, a 45-degree turn to a northerly heading was observed at an altitude of 4,774 feet mean sea level (msl) and ground speed of 91 knots. The following 10 recorded data points over a time period of 80 seconds depicted an increase in altitude to about 5,148 feet msl, and a decrease in ground speed to 55 knots followed by an increase of ground speed to 95 knots at an altitude of 5,056 feet msl, about 0.7 miles south of the accident site. The next two data points spanning 19 seconds showed a decrease in ground speed to 65 knots at an altitude of 5,020 feet msl, almost directly above the accident site. The remainder of the recorded data depicted a reduction in ground speed and a vertical descent to the accident site. For more information, see the GPS Factual Report within the public docket for this accident. Examination of the roof structure, parachute release cable and handle assembly, and arming pin was conducted by a Senior Materials Laboratory technician. The cabin roof structure exhibited a disbonded area where the parachute arming-handle mounting-bracket was adhesively bonded to the roof structure. Higher magnification images of the faying surfaces of the adhesive bonding area on the mounting bracket and the roof structure revealed that the mounting bracket was loaded in peel with the disbonding crack propagating from the radiused bend in the bracket toward the square edge. The balance of the faying surfaces were too rough to establish interfacial contact sufficient to allow adhesive wetting between the adherends. Traces of roof structure paint were observed in areas between the faying surfaces. Examination of the parachute arming handle through-holes with a 5X to 50X stereo- zoom microscope under white light revealed drilled and chamfered holes with a red anodized surface treatment. No heavy scratches, gouges or other indications of abusive use were present. Examination of the arming pin revealed that permanent bending of the pin shank approximately 90 degrees to the plane of the slot cut through the pin shank. Fretting wear deposits were present on the surface of the arming pin shank consistent with shank contact with the surfaces of the through-holes in the parachute arming handle. Scanning electron microscopy and standardless semi-quantitative energy-dispersive spectroscopy (ESD) were conducted on the arming-pin shank surfaces. The EDS analysis indicated that the fretting wear deposits are primarily composed of the oxidized constituents of the aluminum alloy used in the parachute arming handle. For further details on the laboratory examination of the arming handle, pin, and cabin roof, see the Materials Laboratory report within the public docket for this accident.